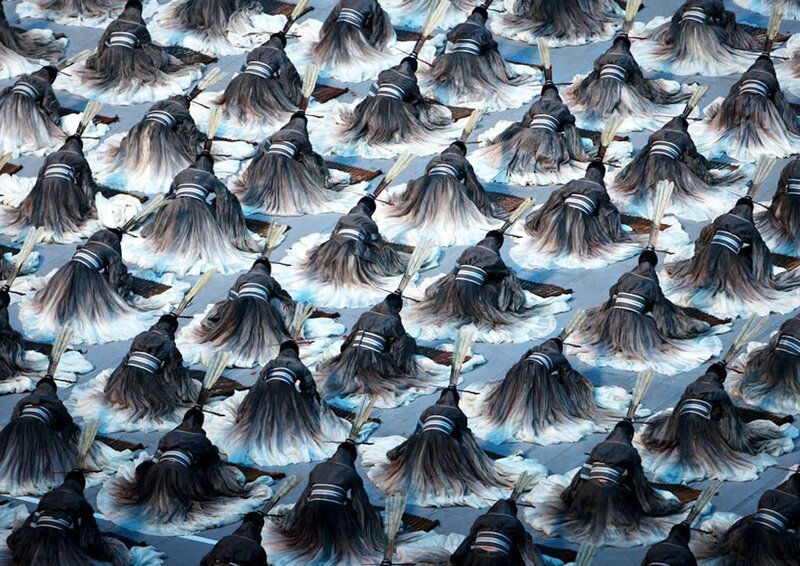 These extraordinary images show the performers at the Opening Ceremony of the Beijing Olympics in China in 2008. Although designed to be creative spectacle for visual and televisual impact, they point to a political and philosophical paradigm; one that we often feel but do not see in the West. Statisticians sometimes show us swarming frameworks applied to crowds and their movements but it is less common to see hundreds of individuals doing exactly the same thing, choreographed, at the same time. The effect, in addition to awe-inspiring pattern, is a visualization of the concept of people making up patterns of communal activity and their role as constituent parts of group activity, impact and affect. This then renders visual the role of synchronized global activity and the impact of swarming and copycat behaviours. Cancerous cells are characterised by their repetition of the same cellular signal much like other natural phenomena such as monocultures, fascist systems, racism and mass-production. Certainly, it makes for a powerful visual impact, however, as we can see and intuit here, it makes such behaviour vulnerable to change, difference, diversity and evolution. This then might offer a foreboding to a nation that represents itself in this way insidiously describing what it expects from its countrymen and how different behaviour might be perceived. As a textiles group with several weavers and knitters in the mix, the notion of the group as tapestry or fabric is an interesting one. If your organization was described as a cloth what might it look like?